vMix 20 adds a number of exciting new features and includes optimizations specific to 4K streaming workflows such as the new “High Input Performance Mode” which takes advantage of the latest enhancements in graphics processing to achieve high end HD and 4K productions on an ordinary PC. Key to this workflow is the new Obsidian Reference System which lists detailed PC hardware specifications that customers can build or purchase from vMix resellers that is specifically optimized for next generation live streaming in HD and 4K. This system has capacity for up to 6x 4K camera inputs via HDMI or SDI, or 24x camera inputs in HD, with additional inputs possible via NDI, media, graphics and titles, all supporting 4K. The flexibility of an open PC architecture allows customers to install whichever capture cards suit their production, with options available for HDMI, 6G and 12G SDI and Quad Link 3G SDI depending on the camera. HD and 4K sources can also be mixed and matched thanks to the built in scaling and frame rate conversion in vMix. Simultaneous streaming and recording in 4K is also possible thanks to the hardware assisted H264 encoding available in the latest generation NVIDIA GeForce 1080 Ti graphics card. 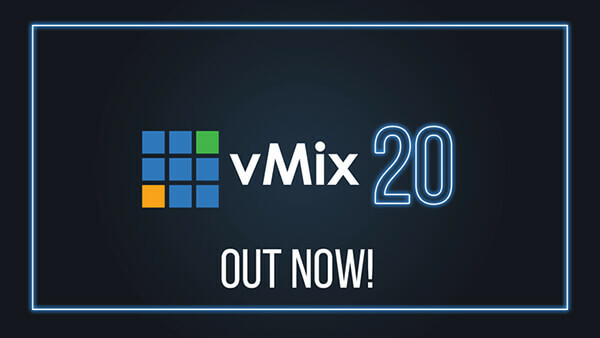 vMix 20 is available now from www.vmix.com, with a free fully functional 60 day trial.